At a time when property ownership has become the hot topic in South Africa due to the controversial land policies of the government, an English couple has presented a special gift for the workers on their South African farm. A group of 30 farm workers at the South African table grape farm Nieuwe Sion, in Simondium near Paarl, have become the proud owners of a purpose built R30m agri-worker housing development. The decision to give ownership to their workers was taken in 2015 by Dr David Potter and his wife Elaine, who live in England, with the aim of giving the workers a chance to enter the South African property market. Amongst those who attended the ceremony to hand over the keys to the farms – and who could possibly gain some perspective of the role the fruit industry can play in creating wealth for those who work in it – were Western Cape Government Ministers Bonginkosi Madikizela (Human Settlements) and Minister Alan Winde (Economic Opportunities). Paul Morris, one of the worker representatives with 30 years of service on the farm, described the gift as uplifting for the workers. “It is a huge opportunity for us. We will look after it,” said Morris. 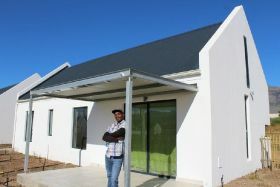 Willem Bestbier, CEO of SATI, said the high-quality development was testament to what can be done when table grape industry and government work together to the benefit of people. Nieuwe Sion is a 70ha table grape, nectarine and soft citrus farm in Simondium in the Western Cape. The complex will supply housing to 140 people, in the form of 22 two to three bedroom houses, varying between 60 and 70 square metres, as well as eight annexed buildings with single quarters for retired workers. There is a crèche and aftercare facilities for workers’ children, a community centre and sport’s field, all designed with the input and needs of the farmworkers being addressed. “The lay-out has been architecturally designed for the complex to be self-sustaining, environmentally friendly and to foster a community spirit,” Du Toit added.